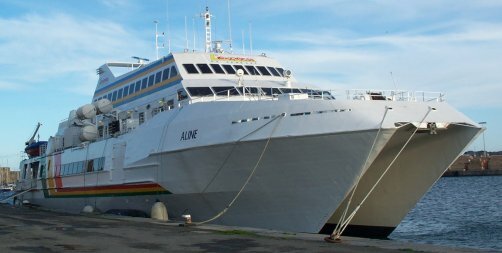 In 2004, the car ferry "Aline" still under the colors of the "Express of Senegal", thus remained assigned to serve Jersey and Guernesey within complementing Solidor 5 who encountered engine problems. She then operates under the banner of Emeraude Jersey Ferries (Emeraude Lines was absorbed by the group Sogestran). A little slower, he completed the connections St-Malo/Jersey in St-Malo/Guernesey in 1:30 and 2:15. Emeraude Jersey Ferries closed permanently in 2004. 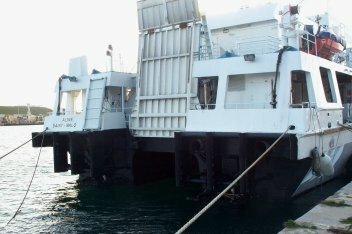 Aline was sold in 2005 and became the Spanish PITIUSA NOVA for Iscomar (http://www.iscomar.com) on the route between Ibiza and Formentera.